With higher temperatures and a longer growing season, farmers in Canada’s Upper Alberta hamlet of La Crête are planting corn. 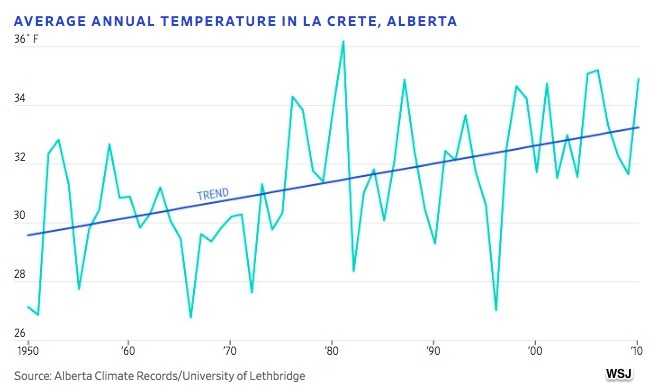 Yes, we are talking about an increase of just 2 to 5.5 degrees Fahrenheit since 1950. But for corn, that is all it takes. Add two weeks to the growing season and you wind up with forests becoming corn fields. Our story though is about more than corn. It is really about markets. We can start with the crops. La Crête farmers traditionally grew wheat, barley and canola. Now, as their climate changes, they have added corn and soybeans. They’ve also added land. With the agricultural potential of the area ascending, so too has the supply of farmland. What once had been forests is now becoming farm acreage. And we can ponder innovation. Plant varieties will need to adapt to changes in the length of the growing season, rainfall, heat, and cold. In La Crête, farmers are already buying seeds that mature faster and are sufficiently hardy to endure their environment. Lastly, a slew of related industries are responding. Their transportation infrastructure, storage capacity, and port facilities all need to adapt. And, think insurance. With land values up and new risk models from wild fires in Alberta, premiums will change. Really, we are just talking about markets. Defined as the process through which demand and supply create price and quantity, new markets are emerging because of climate change. In Alberta, they relate to crops to land to insurance. My sources and more: After looking at wine and weather last year, corn and climate, here and here were the logical next step. However, if you want to read onward to the bigger economic picture, I do suggest William Nordhaus’s Nobel speech that will be given on December 8 in Stockholm. Please note that the Nordhaus quote came from a Bloomberg article. Quote: “Due to heat waves from Africa, in 2018 temperatures increased throughout Europe:” Temperatures up to 47 ° C were recorded in Spain, France, Greece, Italy, Croatia and other European countries. Even if we take the temperature norms of southern European countries for 35 degrees C., the heat waves increased the temperature by an average of 12 degrees. The Paris Agreement recommends an increase in temperature no higher than 1.5 degrees C. Heat waves have raised the temperatures of the recommended standards by 8 times! or 800%! And where the heat will last more than 42 days, the rivers will start to dry up, agricultural products will die at the root, forests will burn, and the hydropower plants and nuclear power plants will stop – that is, all the attributes of existence. Nobody cools Africa, and one or two more such summers, and little will remain of Europe. 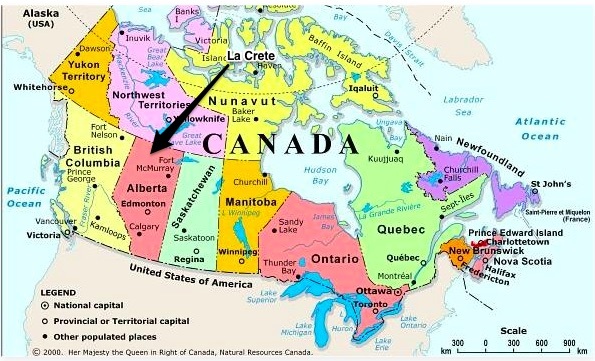 As soon as the Canadian leadership realizes that in order to restore Canada’s climatic parameters, and to protect it from heat waves, it needs a working ecologist – call it – I will come. Цитата: «За счёт тепловых волн из Африки, в 2018 году возросли температуры во всей Европе: «Температуры до 47С были зарегистрированы в Испании, Франции, Греции, Италии, Хорватии и других странах Европы». Даже если брать температурные нормы южных стран Европы за 35 градусов Ц., то тепловые волны повысили температуру в среднем на 12 градусов. Парижское соглашение рекомендует повышение температуры не выше 1,5 градуса Ц. Тепловые волны повысили температуры рекомендуемых норм в 8 раз! или на 800%! И там, где высокая температура продержится больше 42 дней, начнут высыхать реки, на корню погибать сельхозпродукция, гореть леса, и останавливаться ГЭС и АЭС – то есть, все атрибуты существования. Африку никто не охлаждает, и ещё одно-два таких лета, и от Европы мало что останется. Как только руководство Канады поймёт, что для восстановления климатических параметров Канады, и её защиты от тепловых волн, ей нужен действующий эколог – вызывайте – я приеду.